Bryan Garrison of Dreamscape CLS spoke of his business and shared that they now produce custom fence pieces using reclaimed wood in their own woodworking shop. Additionally, Bryan showed a sample of the new ceramic tile product they started using for outdoor patios – it looks nice and solid, and could have a look of stone or wood. What an amazing example of craftsmanship and professionalism! 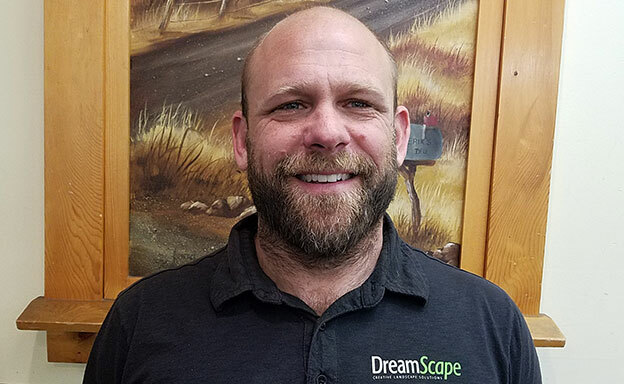 To learn more about Bryan’s professional services please visit www.letipsantacruz.com/member-directory/dreamscape-creative-landscape-solutions-inc. 20 years in business and going strong creating beautiful spaces throughout Santa Cruz County! Bryan Garrison and Dreamscape Landscaping & Drainage encompasses all aspects of design, landscaping, drainage, fencing, lighting & patio work. Bryan is a cutting edge artist when it comes to his designs and landscaping, and a master at solving drainage issues. His fencing and stone patio work turn a back yard in to a vacation wonderland. His integrity & work ethic are beyond question, and he is a delight to work with. I highly recommend Bryan & Dreamscape. Wow is all I can say!! Bryan Garrison is a creative genius! His eye for design is second to none. The name of his company is DREAMSCAPE…a landscape that he will create is a dream…beauty, practicality, functionality, and stunning. He provides a garden retreat that will rejuvenate and bring serenity and a wonderful spot to entertain and to call home. He incorporates all aspects of landscaping from hardscape, fencing, retaining walls, you name it…he can provide! Bryan is more than just a landscaper. His knowledge of decks, fences, gates and other construction type projects is outstanding. He is also an awesome photographer. Dreamscape is a full service landscape company with many years of experience. They always use the highest quality products and provide outstanding customer service. they are locally owned and I love that they use eco-friendly local goods and services whenever possible. Dreamscape has competitive pricing and are the professional choice when any landscaping needs arise. Bryan Garrison of Dreamscape landscaping was our show boater this morning. He showed us his latest addition to his business. He now has a woodshop where he manufactures custom fencing, gates, posts and more. Bryan is a master of creative design which has been key to his success over the years. He also displayed the vast array of pavers and lighting that his clients can choose from. He is well established for a good reason, he is simply the best in the business. If you are in need up a brand new landscaped look or an addition or modification of your existing landscaping, give Bryan a call today!